The active growth phase, in which the hair follicle is close to the scalp, the transition phase and the resting phase. Hair shedding (e.g., during combing or washing) usually occurs in the transition phase, but can also occur in the resting phase. This cyclic process is regulated by different factors, including: proteins, androgenic hormones, vascular endothelial growth factor-VEGF) and genetic factors. These factors influence the slowing down or acceleration of hair growth, the formation of new blood vessels and the improvement of blood supply during the active growth phase. Hair loss is common among two-thirds of the male population, but is also found among women for various periods of time in their lifetime (during pregnancy, after giving birth or at the beginning of menopause). Prolonged hair loss resulting in serious thinning is considered relatively rare. Prominent factors affecting hair health and hair loss include genetic predisposal, problems with blood flow to the hair follicles, hormonal imbalance, certain diseases, unbalanced or extreme diet and severe anemia as a result of iron or vitamin B-12 deficiency. Lack of essential nutrients, such as proteins, vitamins and minerals interferes with the immune system and the central nervous system, causing e.g., depression, anxiety and stress with such consequences for hair health as defective hair structure, strength and color, impaired growth and shedding. Other factors accelerating hair loss and damaging hair structure are various toxic substances present in air, sweat, or dyes and sprays that are absorbed in the hair. Likewise there are reports on hair loss during drug treatment for reducing cholesterol levels and blood pressure, and taking certain drugs. Research findings over the last decade show that hair loss and damage are reversible, and in many cases can be stopped by supplementation with various nutrient, such as amino acids, B-vitamins, iron and zinc. Multi Hair is a unique formula developed by SupHerb, containing various nutrients vital for physiological processes that influence hair growth, strength and health, such as metabolism of proteins needed for hair structuring, hormonal balance and formation of blood vessels leading to the hair follicles. Methylsulfonylmethane (MSM) is a natural organic sulfur compound found in all living organisms. It is present in low concentrations in body fluids and tissues, and in high concentrations in hair and nails. MSM is also called "nature`s beauty mineral" due to its capacity to stimulate the growth, rejuvenation and healthy look of skin, hair and nails. The sulfur is incorporated in a protein called keratin, which is present in high concentration in skin, hair and nails, and is the main protein component of hair. Keratin is responsible for nail strength. Studies have shown that taking MSM at a dose of 3,000mg per day for 6 weeks significantly improved hair growth and vitality. The formula contains a high concentration of the amino acid L-cysteine- a central component in the formation of collagen and keratin - the main structural proteins of skin, hair and nails. Being a strong antioxidant, L-cysteine protects the hair against toxic substances damaging hair structure and growth and causing premature hair loss. In a double blind study a significant improvement in hair health was observed in a group of 72 women, who took L-cysteine together with B-vitamins for four months. A balanced level of vitamins from the B-group - B-6, B-12, B-5 (pantothenic acid) and biotin keeps the different biological processes responsible for proper functioning of the nervous system (hormone balance, metabolism of amino acids and fatty acids and production of neurotransmitters), intact. Low serum vitamin B levels, especially of B-12, causes many functional disorders, such as depression and anxiety, which often go together with hair loss. Abnormal low vitamin B-12 levels were observed in women suffering from hair loss. B-12 supplementation increased the vitamin`s blood level and stimulated hair rejuvenation and regrowth. Biotin treatment at a dose of 0.3 mg per day for 4 months accelerated hair growth and significantly improved hair structure in people who suffered from uncombable hair syndrome. This mineral, which is present in high concentration in hair, has a pronounced influence on the proper functioning of body tissues and on hair rejuvenation and hair growth (8). Lack of zinc is manifested by thin and fragile hair and white spots on the fingernails. Chelating zinc with picolinic acid (zinc picolinate) improves its absorption and bioavailability. Research showed that patients suffering from hair loss after weight loss surgery improved on 200-600 mg zinc per day. Iron is an essential element in the formation of the red blood cell proteins hemoglobin and myoglobin, which serve as oxygen carriers to tissues and body organs. Iron deficiency develops as a result of a diet poor in bioavailable iron or problems with its absorption from food following a decrease in stomach acidity or digestive enzymes, a problem commonly observed in the adult population. In developed countries the percentage of women and men with anemia due to iron deficiency varies between 3.5%-5.3% . Severe iron deficiency damages red blood cell formation and leads to anemia, which manifests itself in a variety of clinical symptoms, including hair growth problems and excessive hair loss. Primary prevention by iron supplementation to population groups at risk of deficiency in critical life phases (childhood, fertile age, adulthood), decreased anemia as a result of iron deficiency (11). * Contains the optimal combination of active, nail and hair strengthening ingredients, at doses providing excellent treatment results, which are clearly visible after only six weeks of treatment. * Contains fine iron at a dose allowing controlled, prolonged and risk-free administration (only 3 mg). * Contains high doses of the most important, nail and hair strengthening, nutrients: 200 mg cysteine, 50 mcg vitamin B-12, 50 mg vitamin B-6 and 250 mg MSM. Instructions: One tablet per day with meals. 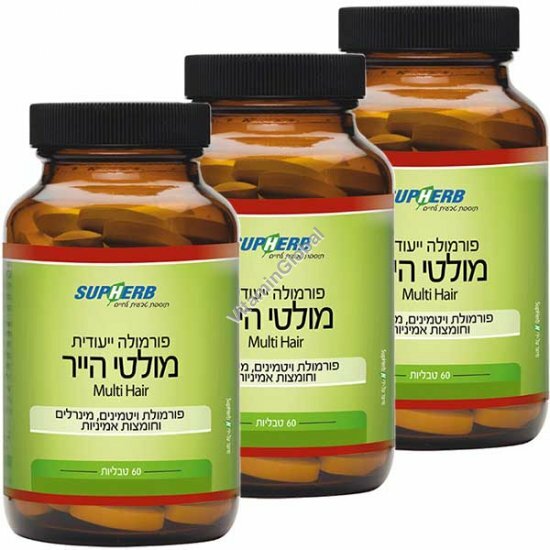 SupHerb Multi Hair Formula is available in packages of 180 (60+60+60) tablets.